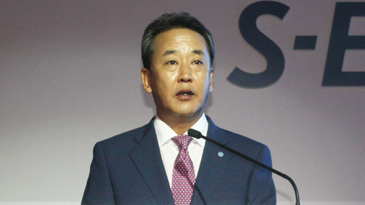 S-Energy CEO Hong Sung-Min announces its global growth plan at the press conference held at Plaza Hotel in downtown Seoul on August 27, 2014. South Korea’s local solar energy company “S-Energy” has just taken a gigantic step to advance into the world’s market as global composite energy group. “S-Energy” has recently come up with a comprehensive mission plan, “Free Energy Planet,” with the help of Communications Korea (CK), a PR consultancy. At a press conference held at Plaza Hotel in downtown Seoul on August 27, 2014 “S-Energy” announced its global growth plan based on its new CI (corporate identity) works. The press conference organized by CK attracted scores of local journalists from nation’s major news media. 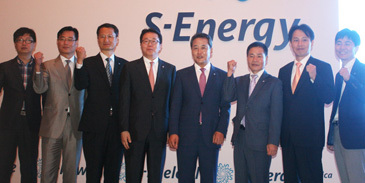 S-Energy CEO Hong Sung-Min (4th from right) poses with his company officials at the press conference held at Plaza Hotel in downtown Seoul on August 27, 2014. Established as the nation’s first solar energy company in 2001 “S-Energy” has been expanding its businesses into related areas. Since its inception its annual growth rate has been over 20 percent. Three sister companies have been set up since then. On the strength of its rapid growth “S-Energy” was listed on the local stock exchange “KOSDAQ” in 2007. In 2010 its export reached 200 million US dollars. “S-Energy” was listed as world’s No. 2 company in financial soundness indicators conducted by Bloomberg New Energy Finance in the third quarter of 2014. Its five major operation areas are "S-Finance," "S-Energy," "S-EIB," "S-Power," and "S-Fuelcell." Based on the five major operation areas “S-Energy” now stands poised to grow as a smart energy solutions group by adding off-grid system, energy management system, and energy storing system. Ms. Julie Lee serves as staff reporter for The Seoul Times. She studied business at Soongsil University in Seoul. She travelled Australia and stayed in Sydney for over a year. Her hobbies include playing the piano and enjoying extreme sports.